Once described as a "diligent apprentice," China has emerged in the early 21st century as an active and sometimes contentious participant in the UN Security Council. For the U.S., China has complicated decision-making on a range of issues, including North Korea, Iran, Iraq, Sudan, Burma, Zimbabwe and Libya. China's material interests in several of these "pariah states" has raised problems for attempts to target such regimes through the Council and its powers under Chapter VII of the UN Charter. Yet China's positions on these cases have been mixed. It has sometimes aligned with the U.S. (as it did on Libya), and has, at other times, stood in opposition (as on Burma). This study seeks to explain the variance. Drawing on an array of sources, it weighs five hypotheses against the empirical record. These explanations are centered on two sets of factors. First are the strategic risks of cooperation, i.e. the chance that coercion will harm China's interests. Second are the political ramifications, i.e. the potential costs to China's relations with the U.S., regional stakeholders and others associated with particular positions. 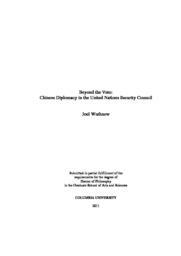 Prefaced by a historical narrative of China's changing role in the Council from 1971 through 2011, the analysis covers eight cases, spanning China's diplomacy on North Korea, Iran, Sudan, Burma and Zimbabwe. Five are positive cases, insofar as Beijing supported U.S.-backed resolutions. These include the issues of North Korea and Iran. Three are negative cases, in which China maintained opposition. These include proposed sanctions on Sudan in 2007, and draft resolutions on Burma and Zimbabwe. The primary conclusion is that both strategic and political explanations can provide insight into the development of China's positions. Specifically, China's bargaining power is at its greatest when credible outside options exist and when there is a division in attitudes towards the legitimacy of the preferences of the U.S. and its allies, and weakest under the opposite conditions. From a policy point of view, the U.S. will have to craft nimble diplomatic strategies and carefully assess when to proceed versus when to yield. However, Washington can assume that China will remain a status-quo oriented, and relatively predictable, participant within the UNSC.